Technical difficulty: moderate. 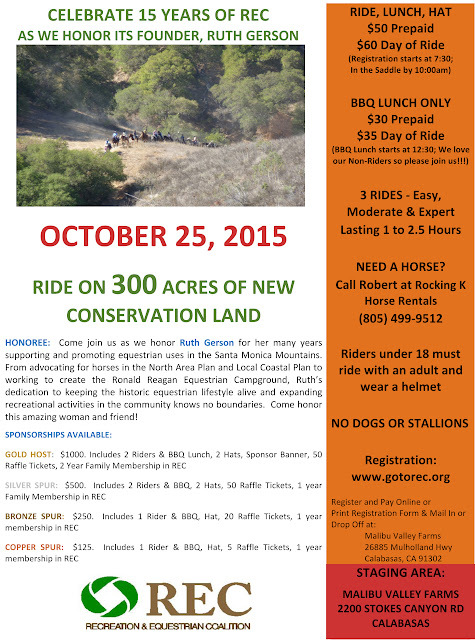 Single track trails, overgrown oak and poison oak, and dangerous crossing on major roads before entering parkland. Staged at Malibu Farms, walked across Mulholland Highway to Las Virgenes Road, crossed over into the Santa Monica National Recreation Area, followed trail to the former Reagan Ranch, then returned by same path. 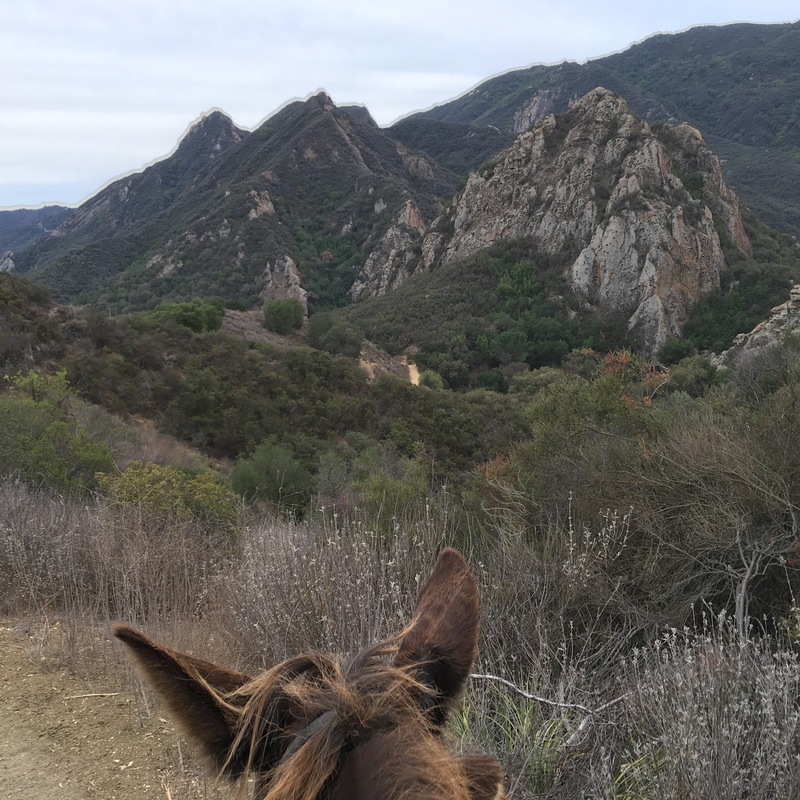 The magnificent mountains of Malibu are a treasure to ride on a mule, and a fundraiser for the REC organization offered Tobe and I a chance to explore a new part. The Goat Butte rock formations rise up like something from a Chinese painting, stark and massive. 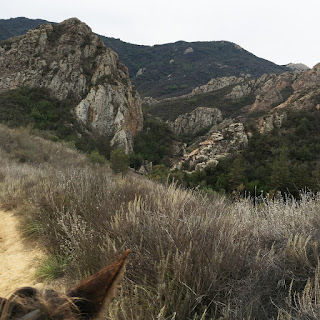 The lower trails are mostly quite civilized, winding among the mountains and providing a way for city dwellers to hike, push strollers, or bicycle into the wild areas just minutes from the city centers. As the trails rise up they get more technical and complicated. The trail group was about 40 people led by an experienced local, and we slowly wound our way through the compelling landscape. The Eastern portion of the ride went onto the former Reagan Ranch, that belonged to Ronald Reagan when he was a Hollywood actor. 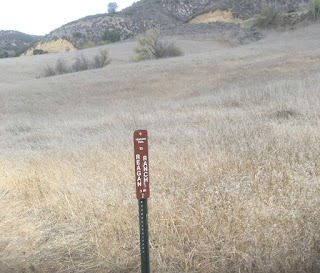 When he was elected governor of California he deeded it to the State and it was combined into the Malibu Creek State Park. We saw some old ramshackle clapboard buildings but I do not think that was where he lived, we were following the Yearling Trail up to the outbuildings and then we turned around and came back. 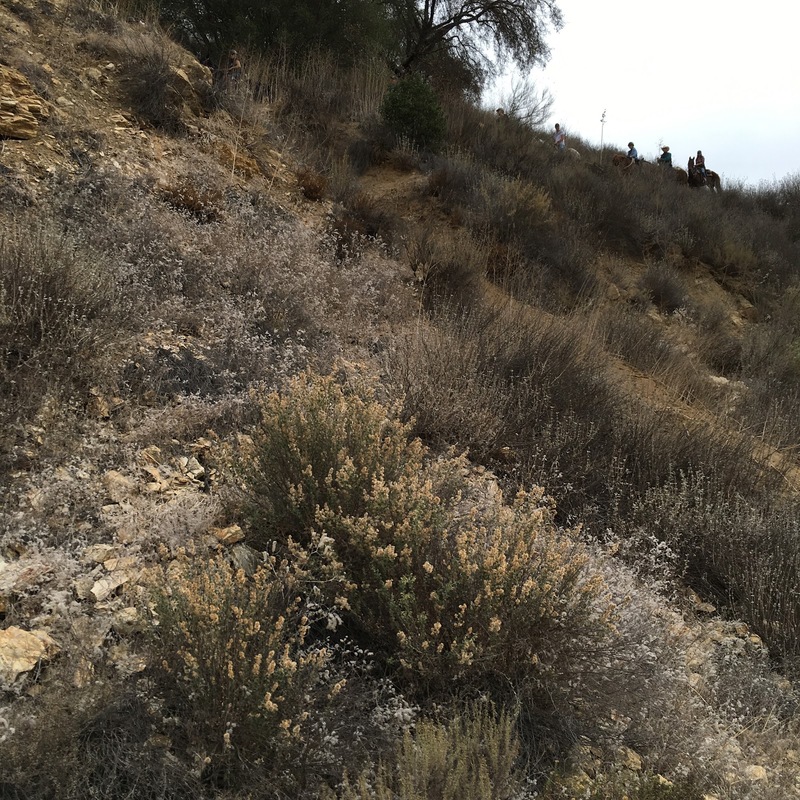 The dry sagebrush and fields of grass were a tinderbox, a perfect example of the effect of the 4 year drought California is enduring. You can't ride through it without imaging how quickly fire would whip across this desiccated landscape. Then, a very weird thing happened. At one point the trail boss decided to short-cut a switchback and go off a cliff on his endurance horse. He was on the trail one minute, and then he was gone. He called up to the second person in the string encouraging her to go do it also, and so another rider went over the edge, while the third in line opted for the more sensible round-about route. I had a real moment. Because of the wreck Tobe and I got in in 2012 I have had a long route getting me to have confidence in him again, and most especially I felt triggered by heights. This was an OPPORTUNITY. We had both just seen 2 horses do this drop-off, and what a horse can do surely a mule can do! So I led him to the edge and down we went. There is what it looked like after I looked back up, and the next riders in the group are coming along the trail so very far above. 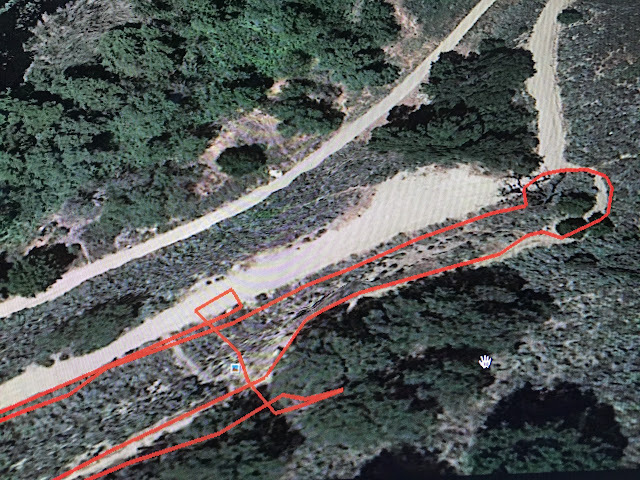 The trip OUT is the one that comes from middle left, around the switchback, and calmly up the upper trail and exits bottom left. 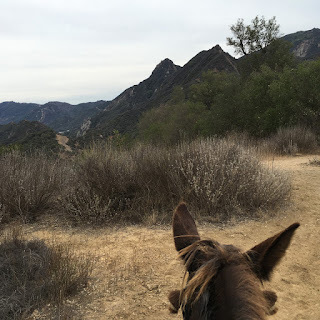 BUT the second time through on the way back we are entering bottom right, we get to the steep slope, I hesitate and dither, and then I go straight DOWN and do a happy dance at the bottom before we all continue on back to the trailhead. 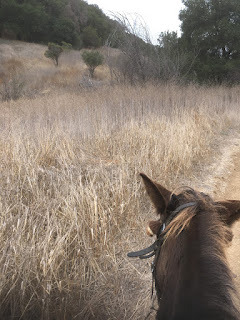 Then we did a bit of loping along on some of the wider paths, shaking off the adrenalin of that fear faced and conquered..
Now, understand, I am not a sporting kind of person. Going over that cliff edge was a HUGE accomplishment for me. I figured if Tobe just saw two horses do it right in front of him there was no doubt HE could do it. And I very much needed to push the boundaries of the PTSD I have been carrying ever since that cliff descending wreck. I needed to trust the mule, and trust myself. 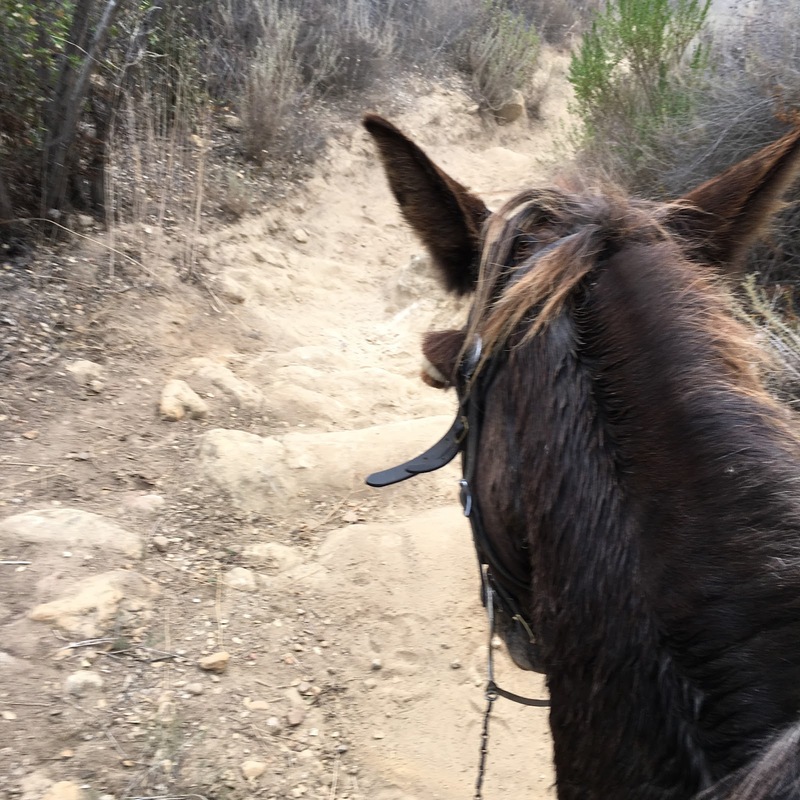 One thing I noticed was that while the horses slid and skid straight down, my tactical mule tacked like a boat sailing into the wind. 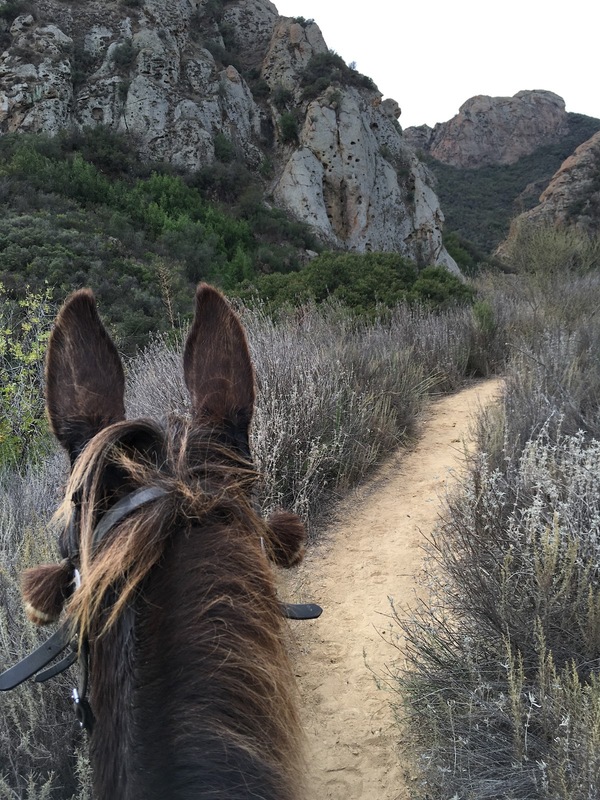 He turned from right to left and zig-zagged our way down, while I held on and balanced myself and put all my faith into Mule Power. In a very real sense we bonded as a team like never before. I asked of him more than I was comfortable asking, and got more than I expected. 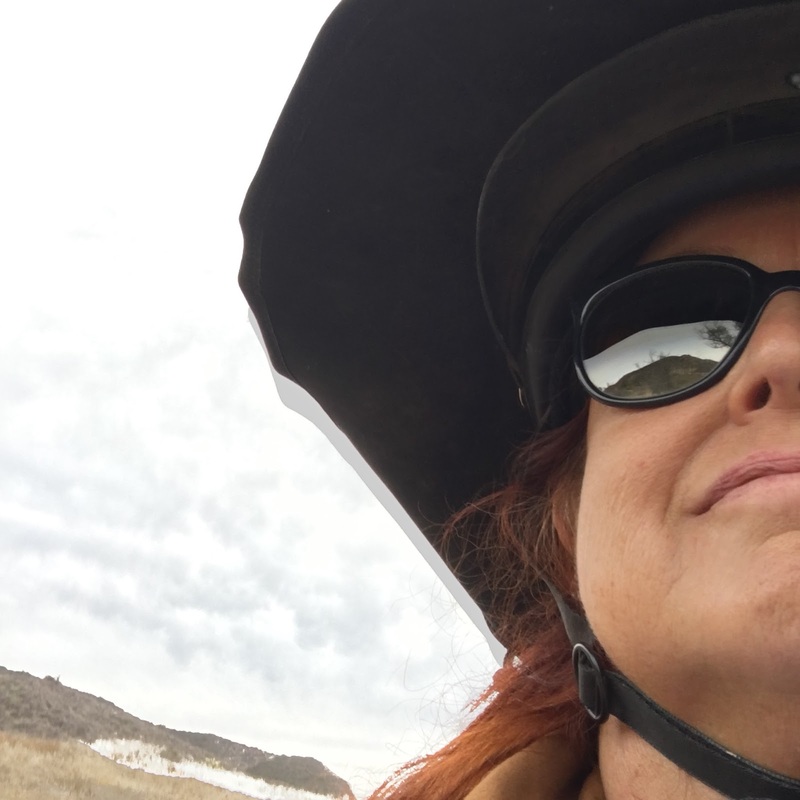 Not being a person who has ever played sportball, I was astonished at the full body rush of accomplishment I got when we got the bottom of the incline. It felt like what I see on the faces of soccer players after they win a game. After we got back to the staging area I asked the trail boss to tell me what the incline and length of the hillside was. Because I wanted to brag but not exaggerate. He said it was about a 70 degree slope and 50 yards down it. It was utterly exhilarating. 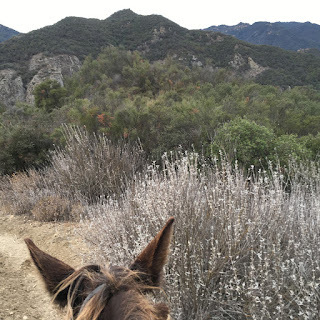 Knowing that I can count on my mule to get me thorough a challenge like that is just wonderful.